Loose Parts cross the boundaries of gender, age, abilities, and socioeconomic challenges. 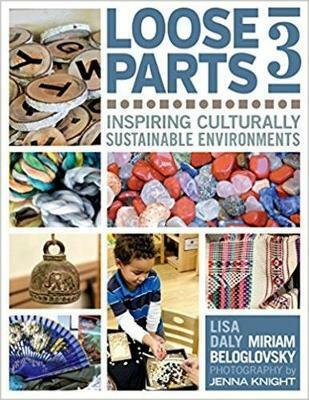 Loose Parts 3, the newest addition to the wildly popular Loose Parts series, helps teachers make a conscious effort to create culturally sustainable environments that allow children to grow and to conquer a dynamic world. Loose Parts 3 contains inspiration and guidance on how to create culturally sensitive and culturally sustainable early childhood environments through six key terms: aesthetic, authenticity, equity, dynamic, praxis, and critical reflection. Use your environment to promote a sense of wonder, curiosity and joy, and allow children to explore their identities. *2018 Foreword Reviews Indies Finalist in the Education category. Miriam Beloglovsky, MA, is a professor of early childhood education at Cosumnes River College where she has advised and guided students for over 25 years. She has served as a consultant, keynote speaker, presenter, and board member to a number of organizations and conferences, including My Street of Dreams. She is also co-author of Loose Parts: Inspiring Play in Young Children and Early Learning Theories Made Visible. Lisa Daly, MA, is a professor of early childhood education at Folsom Lake College. She has over 30 years' experience as an early childhood teacher, director, and educator. Lisa has presented numerous workshops for educators on art, storytelling, language and literacy, sensory experiences, and music and movement. She is also co-author of Loose Parts: Inspiring Play in Young Children and Early Learning Theories Made Visible.